Although, as a Wine Buyer, I always need to keep an extremely open mind and a consistent yet very eclectic palate toward the wines that I try, taste and more especially buy (ranging from the driest, acidic or tannic, most esoteric to the fuller, often way too ripe - for my taste - and alcoholic style of wine), I recognize that, like anybody else, I also have my favorite wines that correspond a bit more to my true palate and that I rather drink at home. In most cases, I like to be surprised, intrigued, pleased and even fascinated by the wines that I will buy and put on the shelves, and I like my customers to experience the same thing when they will try it. You see, I love my job (not everybody can say that... isn't it? ), and what makes it even more interesting and kept me going to work in the wine-business as a Wine Buyer - Sommelier and Wine Director for the last 18 years, is the fact that I have to understand, comprehend, learn about, dissect and analyze each wine that I taste everyday, not only to keep my palate sharp, trained and skilled, but also to be able to always provide, everyday, the best, most interesting and most eclectic choice of wines from all around the world to my customers. And that's what I try do everyday at the store: please and satisfy the interest and the curiosity of my customers by sharing my knowledge with them, offering great service by trying to understand their palate, what they would like to drink and more especially respect their budget, but also trigger their interest by always trying to recommend them different wines from various countries to extend their experience. There is nothing worst than to go shopping in a wine store where the staff has no knowledge, no passion and no conviction, and thus where the wines are boring and have the same type of taste profile due to a narrow minded wine buyer behind the wine selection on the shelves. What I love the most and what usually pleases most of my customers, is that I usually do a good job in general by recommending the most appropriate wines (despite a few exceptions from time to time, nobody's perfect...), but my forté is the wines under $20 and more especially the wines under $15. As I always say: "I'm the King of under $15", and that for 2 reasons, first because I rather (and it is much more fun) sell 12 different bottles at $10 than 1 bottle at $120, and second, because (like most of my customers) these under $15 wines are the ones that I drink at home with friends and family, thus that I know the best and that I can more easily recommend with even more conviction and excitement. The next 4 wines are part of these little gems that I had a lot of pleasure to suggest lately to my customers. I hope that if you'll try them and you'll agree with my choices. These are some of my favorites of the moment. Enjoy them young, as an aperitif with hors d'oeuvres, but also with more sophisticated Fall-Winter dinner stews like: "Ragoût" (any stew), "Daube" (usually prepared with beef braised in red wine vegetables, garlic and herbes de Provence), a "Blanquette de Veau" (prepared with veal in a white sauce, but also be made with Lamb, Chicken or Rabbit) or even with a "gibier" (Game). Domaine of Henry Fessy produces wines for generations in the village of Saint-Jean-d'Ardières, located in the southern part of the Beaujolais region, east of Brouilly and west of Belleville (south of Macon and north of Lyon). The ancestors of Serge and Henry Fessy, the Pellissier family, began to buy, grow and sell wines in 1888. Then, they bought a wine estate in the heart of Beaujolais ("Le Paradis") in Brouilly. After the first World War, Henry Fessy, the son in law of Jean Pellissier, became the successor and started to run the estate which now bears his name. It was a very distinguished man that inspired respect. He created the co-operative cellar of Bel-Air in 1928, and remained its President for more than 40 years. In 1947, his son Georges took over the family estate and continued with dedication the work of his father helped by the rest of the family. Nowadays, the Domaine is run by Henry (named after is grand-father) and Serge Fessy, his little brother, who carefully take care of the 11 hectares of vines planted mainly in Brouilly and Beaujolais AOC, but also carefully select the grapes and wines that they will vinify, age, bottle and sell under their Négociant label. They also take care of the wines of different growers. Today, including the resulting wines from their vines and the wines that they bought and vinified, they produce more than 2 millions bottles from a state of the art cellar facility which allow them to proudly insure the quality and the consistency of their wines. They are probably the only Négociant company in Beaujolais which completely vinify their own wines. Domaine Henri Fessy produces quite a few wines from all the appellations of Beaujolais, the 2 generic and the 10 Crus: Beaujolais, Beaujolais Villages, Brouilly, Cote de Brouilly, Régnié, Morgon, Chiroubles, Juliénas, Chenas, Fleurie, St. Amour and Moulin à Vent. Régnié was the most recently recognized cru of Beaujolais in 1988. Despite its resemblance with its nearby siblings Brouilly and Morgon, Régnié possesses it sown typicality which defines its personality. 2008 Henry Fessy "Château des Reyssiers" Regnié is a charming, easy going, light Gamay wine. The robe is light, bright ruby red. Developed aromas of red berries, like red currant and raspberry, with subtle floral perfume constitute the nose. In the palate, the attack is quite juicy and fruity, expanding nicely in a structured, elegant and supple mid-palate. The acidity carries the red fruit flavors with focus toward the lingering, fresh and dry finish. Quite well rounded without excessive tannins, this wine is well made, simple yet refined and charming, somewhat feminine and refreshing with a twist of earthiness. Enjoy it warm temperature with white meat and poultry, or even slightly chilled with fish or cheese. 2006 Cantele Salice Salentino Riserva is roughly a blend of 80% Negroamaro and 20% Malvasia Nera, from vineyards located next the village of Guagnano. After de-stemming, crushing, maceration of 6-7 days and fermentation, this Riserva wine aged in temperature controlled stainless steel tanks for 3 years with selected lots being transferred to French and American "barriques" (barrels) where they matured for at least six months to add more dimension and structure, before bottling. The robe is quite intense, dark ruby red. The expressive nose exposes earthy aromas of ripe red fruits, spices and cigar box, woody notes. In the mouth, it is fruity, dry and earthy, quite full yet balanced by the tannins and great acidity to keep it fresh, almost crisp, with ripe red and dark fruit and hints of spices. Smooth and rounded in the finish, with gentle vanilla oaky notes, it is pretty easy going and perfect for simple dish and picnic, yet it structure and texture can definitely complement heavier and earthier "wintery" dishes, like roasted or braised beef or lamb. Perfectly fine with pasta and meat sauce. Ideal with medium to hard cheese. The Domaine de Fenouillet is situated in the village of Beaumes de Venise at the foot of the "Dentelles de Montmirail", the heart of the finest vineyard sites in the southern Côtes du Rhône. The Domaine has been in the hands of the Soard Family for many generations, until 1989 the grapes were harvested and immediately sold to the growers' cooperative. Vincent and Patrick Soard took over direction of the domaine in 1989 and, at that point, began to vinify their harvest and bottle the wines now made at the estate. The Domaine: There are 16 hectares planted to grapes: 5.3 hectares devoted to Muscat to make the fabled Muscat de Beaumes de Venise; 7.7 hectares planted in the appellation of Cotes du Rhone Villages "Beaumes de Venise"; and 3 hectares within the Cotes du Ventoux appellation. Average production levels are 34 hectoliters per hectare yielding approximately 5,000 cases of wine per year. The vineyards for the Beaumes de Venise Rouge are situated at an altitude of 350 meters and rest in soil composed of clay and chalk. The grape combination for the principal reds is: 60% Grenache, 20% Syrah, 10% old vines Mourvedre and 10% Cinsault. Vinification: The entire harvest is done manually. The Muscat for the Muscat de Beaumes de Venise is picked at optimum levels of maturity to achieve maximum sugar concentration. Several passes through the vineyards and a severe selection of the individual clusters is done prior to fermentation. Crushing is done with a modern pneumatic press to extract the finest juice which is then fermented under temperature-controlled conditions for about 15 days. The fermentation is then stopped to leave the wine with residual natural sugar. The Muscat de Beaumes de Venise is normally bottled in the spring of the year following harvest. For the Beaumes de Venise Rouge and the Cotes du Ventoux, the varietals are harvested and vinified separately and then blended to create the final cuvees. 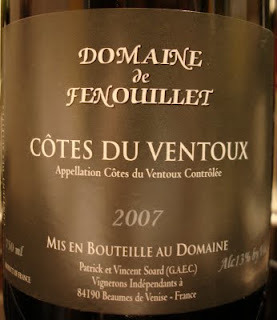 The Cotes du Ventoux is vinified with the objective of making a fresh, fruity wine for current consumption. The Beaumes de Venise Rouge, with its component of old vines and concentration of Grenache, is solidly built, deeply colored and quite age worthy. There is an extended cuvaison to achieve maximum extract; the wines are aged in both "cuve" and barrel; and the bottling is done normally after two years of aging without being filtered. Beginning in 1995, the Soards have bottled a special cuvee of Beaumes de Venise Rouge known as "Cuvee Yvon Soard", in honor of their father. This extremely limited production wine is exclusively from old vines and provides an additional level of complexity and intensity. France and Bernard Boudouresques own the Château de Massiac, located in Azille, a small village in the heart of the Minervois appellation south of one of the best Minervois' vineyards "La Liviniere"(also an appellation on its own since 1999), on the road between Carcassonne and Narbonne (Aude, western Languedoc, France). 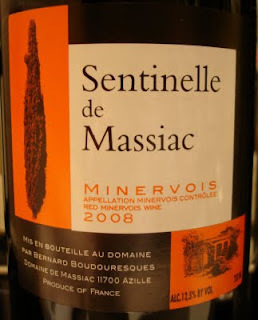 Sentinelle, being the second wine of Château Massiac, is a blend of younger vines 50% Syrah and 50% Carignan, compared to the first wine which is normally older vines 75% Syrah and 25% Carignan, planted on rocky clay-limestone soils. Here again a very bistro-ish wine, well balanced and easy going little red wine, with a soft, versatile and food friendly profile (everything that I love and that I'm looking for when I buy and drink a wine, somewhat my specialty... finding these little everyday gems: great wines at very affordable prices! I definitely love my job). In the glass, it is dark in color and quite intense. The nose is clean, fresh yet ripe and gentle with dark fruit and blackcurrant aromas. The palate is very friendly, supple with nice ripe dark berry flavors mixed with earth and garrigues notes. Tannins are present yet integrated and the earthy finish is quite inviting. A really enjoyable sipper red for a very decent price, to appreciate all day long with cold cut, charcuterie, steak frites and other bistro food and easy going red meat dishes. Love it. I couldn't find much info about the winery and the importer Madrose/Rosenthal doesn't have any info on their website. However, here is their contact info: Massiac, Chateau de Massiac (alo under Domaine de Massiac) 11700 Azille - Tel: 04.68.91.49.92 (I like the wine so much, I will surely give them a phone call soon to ask for more info, may be I will write a post about it). I have the 2008 version of this wine. I like it -- yet I like most wines from Languedoc. Fruit is almost too ripe, so one would have to like the carignan grape (only 25%) and very ripe syrah.